(CNN) -- North Korea has invited inspectors from the U.N. nuclear watchdog back into the country to monitor the shut down of its main nuclear reactor, state media reports. A letter inviting a "working level" delegation to visit and monitor the suspension of the operations of nuclear facilities was sent to the International Atomic Energy Agency, North's Korean Central News Agency reported Saturday. Earlier Saturday, frozen North Korean funds that were thawed as part of a February agreement to get Pyongyang to abandon its nuclear program were transferred out of a bank in Macau, China, to a Russian bank, where North Korea has an account. Ri Je Son, North Korea's director general of the General Department of Atomic Energy, sent a letter to the IAEA confirming that transfer of the funds was completed as required before the invitation would be extended, according to KCNA. Francis Tam Pak-yuen, Macau's secretary of economy and finance, said more than $20 million went from Banco Delta Asia to a North Korean account in a small private Russian bank via the Macau Monetary Authority, the U.S. Federal Reserve and the Russian central bank. The funding, $25 million, was frozen at the bank in late 2005 at the request of the United States, which claimed some of the funding came from illegal activities. As part of a February deal agreed upon during six-party talks aimed at North Korea's denuclearization, however, the funds were freed. North Korea had been expected to announce its steps in implementing the six-party agreement upon confirmation of the money transfer. Under the agreement, North Korea will shut down its Yongbyon reactor and allow the IAEA back into the country to monitor the process. Besides freeing up the funds, countries involved in the six-party talks are to provide emergency energy assistance equivalent to 50,000 tons of heavy fuel oil. The agreement was reached in September after six-party talks involving North Korea, the United States, China, South Korea, Japan and Russia. At a February 13 meeting, a set of initial actions were agreed upon, including freeing the Macau funding. In exchange for North Korea's denuclearization, the nations have pledged to provide the reclusive Communist nation with political and economic incentives and security guarantees. 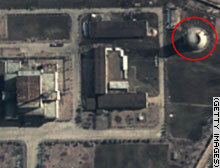 North Korea's main nuclear reactor Yongbyon is in the process of being shut down.